While this blog tries to cover all angles in hockey, especially the bigger stories, there seems to be a lot of negative news. Suspensions, fights, losing streaks, and firings seem to dominate the headlines during the season. However, the Christmas season always brings out one tradition in Calgary and Edmonton that is bigger than the game on the ice as these two Western Hockey League cities make one of the biggest charitable donations in all of hockey. The annual Teddy Bear Toss in these two cities is nearly larger than life, and that's an amazing thing to say as the Hitmen and Oil Kings show their connection to those communities. 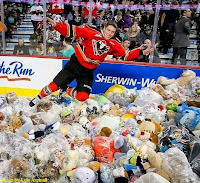 The Calgary Hitmen hold the world record for the Teddy Bear Toss, and they set it back in 2007-08 against the Prince George Cougars when 26,919 stuffed animals rained down upon the Saddledome ice after Ian Duval scored the first Calgary goal in a 6-2 win. That's an amazing amount of stuffed animals when you consider that only 17,341 fans were in attendance that afternoon. Well, the Hitmen were back at it today, and they were looking to out-animal that total from 2007-08. The only catch? Fans couldn't stop bombing the ice until the Hitmen had scored their first goal. The team trying to prevent that from happening? The Moose Jaw Warriors. Could they resist the Hitmen's attack to prevent the deluge of fluffy animals? Radel Fazleev's goal at 1:38 of the first period opened the floodgates as it literally rained cats and dogs and bears in the Saddledome. His celebration of Michael Jackson's moonwalk was pretty good as well, so Fazleev's goal should be pretty memorable. The night itself was almost as memorable as the Hitmen posted the fourth-highest total of stuffed creatures in team history at 25,214! Well done, Calgary, in supporting your Hitmen! Some notable players who have contributed to the raining of stuffed animals? Winnipeg's Andrew Ladd did it in 2003, Ryan Getzlaf made it rain in 2004, and Toronto's Brandon Kozun kicked off the festivities in 2008. Pavel Padakin had made it rain for the Hitmen last year against the Medicine Hat Tigers and was also the player of record in 2012 when he opened the scoring against the Kootenay Ice. Unfortunately, Padakin was traded to the Regina Pats this season as the Hitmen found themselves with an abundance of European-born and over-aged players. So no Padakin this season, right? Wrong! Padakin, as a member of the Pats, did something no other player has done: he has made it rain in three-straight seasons! Maybe Padakin just needs to be told there will be teddy bears tossed at every game? He could be the WHL's best sniper! On the Edmonton side of things, the Oil Kings had 11,492 stuffed animals tossed on the ice after their goal, and that's another exceptional number for a WHL team. Combined, the two teams from the biggest Alberta cities brought in close to 38,500 stuffed animals this year that will be donated to hospitals and charities across Alberta this Christmas season. That's incredible, and it speaks volumes about the fans in those cities. Well done, fans, and keep up the excellent giving during this holiday season! Until next time, donate a stuffed animal for a child today!